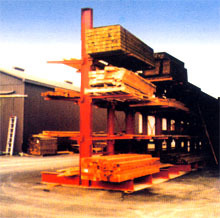 Let Superior find solutions to difficult storage problems with safe, efficient and easily accessible cantilever systems. STORE ANY SIZE OR SHAPE OF PRODUCT. Provides unobstructed entry for truck forks with no uprights or horizontals in the way to gain access to bars, rounds, coils, angles, channels, lumber and more. What can typically be stored on cantilever racks?